This autumn has been an extremely busy time for me, and early in the autumn, I startedï¿½trialingï¿½a new work-planning and organising system.ï¿½ It is very simple and, my conclusion is, it works magnificently. 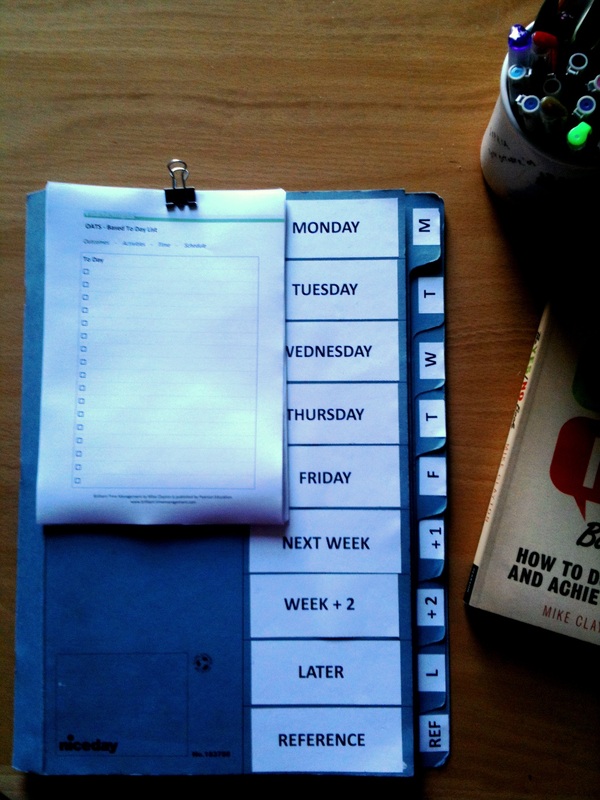 It is based on an inexpensive stationery item, a simple multi-part folder.ï¿½ In my case, I use a none-part file like this one: http://amzn.to/U2dqJh. I hope the first five are pretty self-explanatory.ï¿½ At the end of each week, I move all of the papers, notes and other materials I have in the ï¿½Next Weekï¿½ tab to the day on which I want to deal with them.ï¿½ I move all of the ï¿½Week + 2ï¿½ items into the ï¿½Next Weekï¿½ tab, and review all of the items in the ï¿½Laterï¿½ tab and move some of them into day tabs, ï¿½Next Weekï¿½ or ï¿½Week + 2ï¿½.ï¿½ I use the ï¿½Referenceï¿½ tab to house any papers I want to have neatly stored on my desk: easy to find, but out of the way. On the front, I have a small spring clip, holding a small pad of To Day sheets. Each evening, I do my OATS Plan for tomorrow, looking in the relevant tab and making my list.ï¿½ I keep my running To Do List in the ï¿½Week +1ï¿½ tab and at the end of each week, I use Post It notes to transfer items into the day tabs. Thatï¿½s it.ï¿½ This is the closest I have ever come to devising a ï¿½systemï¿½ as I donï¿½t really believe that they help most people.ï¿½ Systems work if you are a system person and if the system is right for you.ï¿½ This is more a way of storing and organising ideas and information to help you use your own process.ï¿½ If it works for you, do let me know.